Jim Kirkpatrick is a renowned guitarist and musician from Cheshire, England. With 20 years of professional experience Jim has become an in demand session player, writer and performer and is becoming recognised as one of the UK’s premier slide, blues and rock guitar players. ​Jim has been the lead guitarist with legendary British classic rock band FM since 2008 appearing on the recent albums ‘Metropolis’, ‘Rockville’, ‘Rockville 2’, ‘Heroes And Villains’ and ‘Indiscreet 30’ also co-writing the bands UK radio hits ‘Hollow’, ‘Bring Back Yesterday’, ‘Crave’, ‘Better Late Than Never’ and ‘Story Of My Life’ all of which were playlisted on BBC Radio 2. ‘Crosstown Train’, ‘Bad Addiction’, ‘Better Late Than Never’, ‘Cold Hearted’ and ‘Runaway Train’ have all been playlisted on Planet Rock along with several others. 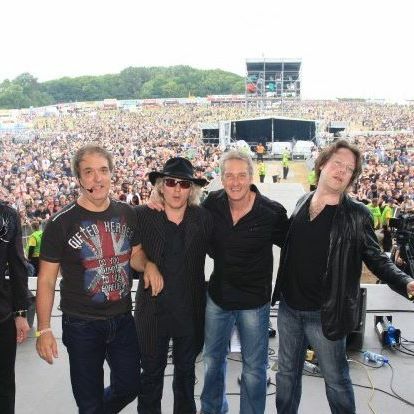 FM have toured the UK and Europe over the last eight years playing at some of the worlds biggest and most prestigious rock festivals and have also supported some of the biggest names in music (Thin Lizzy, Journey, Foreigner). ​As well as releasing his own album ‘Changed Priorities’ in 2006 Jim has played guitar for singer/songwriter Thea Gilmore on and off since 2003 and toured Europe and the USA with her extensively as well as appearing on many of her albums. ​Jim has also been onstage right hand man to former Whitesnake guitarist and hit songwriter Bernie Marsden since 2006 recently collaborating with him and several members of the late Rory Gallaghers band on a tribute to the legendary Irish guitarist. ​Jim has performed all over the world and appeared at major festivals including Download, V 2004, Graspop, T In The Park, Sweden Rock, Cropredy and the Calgary Folk Festival.